Click the button below to view previous editions of The Bounty and The UK Log, together with detailed contents listing and online articles. 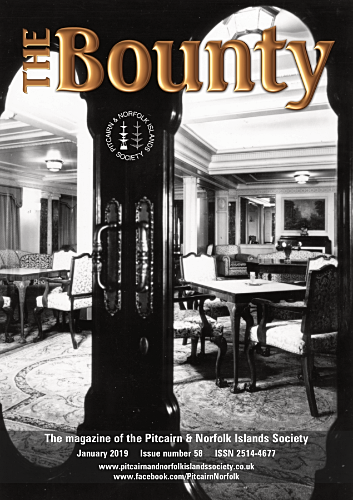 The Bounty, formerly known as The UK Log, is the magazine of the Pitcairn & Norfolk Islands Society (PNI). The Pitcairn Islands Study Group (PISG) was formed in North America and the UK organisation was constituted from an informal meeting of PISG members resident in the UK during 1987-88. The UK Group changed its name to PNI in 2012. The magazine is issued free to all PNI members every six months, and complements the quarterly magazine Pitcairn Log, which is distributed to members of the United States group. The next edition of The Bounty will be published in July 2019. Your articles are welcomed at any time, but the closing date for receipt by the editor for the July edition is 1st May, unless by prior arrangement with the editor. The editor reserves the right to refuse any advert considered unsuitable for the magazine. A reasonable amount of artwork required for your advert will be carried out free of charge and the advert will be proofed to you by email before publication. Paid up members of the PNI, may deduct 20% from the above prices, and will be guaranteed a space in the magazine. Sometimes it is possible to place adverts for members totally free of charge if space allows. The video above shows part of the view of London, looking towards St Paul's Cathedral, from the window of our current meeting headquarters at Doggett's Coat and Badge, near to Blackfriars Railway Station. As a member of the PNI you are entitled to attend our twice yearly meetings free of charge. Refreshments are available to purchase from the bar, and there is an excellent restaurant on site. Click this button to download a free sample PDF copy of the July 2017 edition of The Bounty. When you join the Society, you will be sent a printed copy of the magazine twice a year.